I anticipated having an easy time coming up with goals for this new year, but ended up having a surprisingly hard time! 2017 was so unpredictable. I would never have guessed that a major injury would be sustained and would require nine months to come back from. So with that in mind, my goals are not as ambitious as they might have been otherwise. Whereas last year's goals were very focused on our specific discipline (jumping), this year's goals are much more focused on flatwork and communication between Casey & I. I don't really know what this year will look like for Casey and I, but I know that my priority is making sure that we continue to work on getting physically stronger and communicating better. NO MAJOR INJURIES IN 2018! This is the goal that I have least control over, but that I most want to achieve. My way of trying to make this goal successful is really being preventative in my care for Casey. 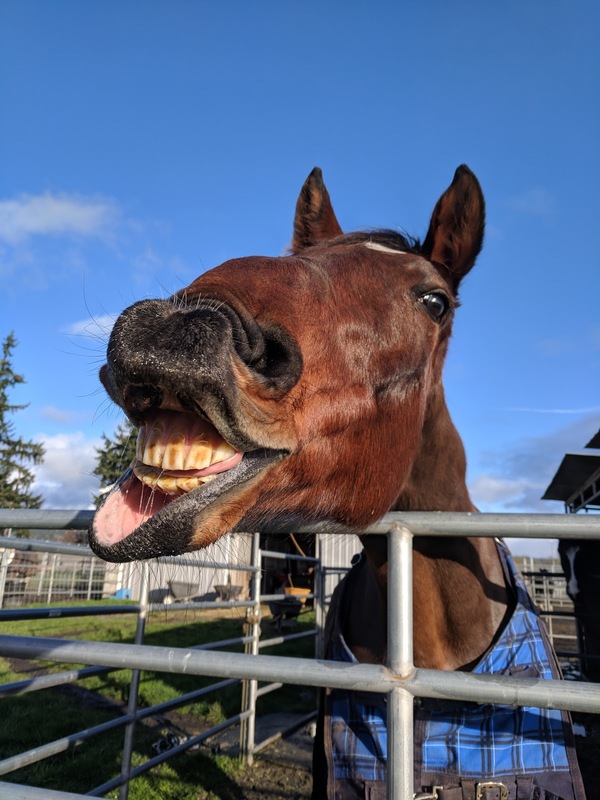 She now has full shoes, hock injections every six months, Mare Magic to balance her mood, and a tiny pasture to get her yaa-yaas out in. Hopefully all of that plus a little bit of luck will get us through the next twelve months without any major injuries (*knock on all wood objects*). Casey agrees. No more injuries please. Get back into jumping 2'6"+. I'm not sure how high exactly we'll be able to jump this year. It really depends on how Casey's leg handles the stress of jumping post-injury. I'd say that 2'6" courses is an achievable goal. I'd love for us to get back to jumping 3' courses, but don't want to prioritize jumping high over my horse's health. Obviously I will be very reliant on my trainer's feedback to determine what is appropriate work for my horse. I want to jump real jumps again! Continue to work on stirrupless work. 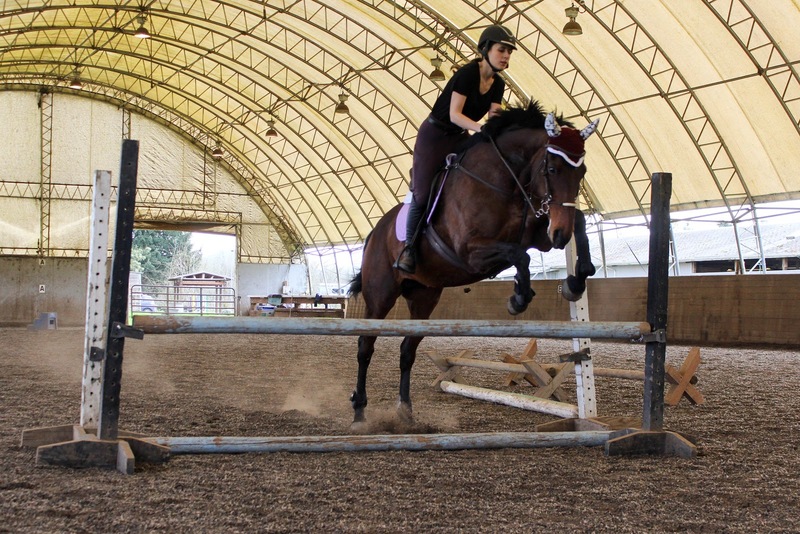 I'd love to get to the point where I can ride without stirrups for a whole ride. That'll take a lot of work though! Continue to work on bridleless work. 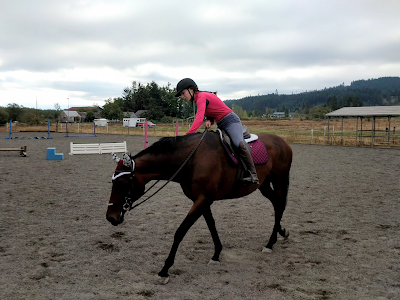 At this point we're able to walk entirely bridleless and can trot with the neck rope (with the bridle on for backup). 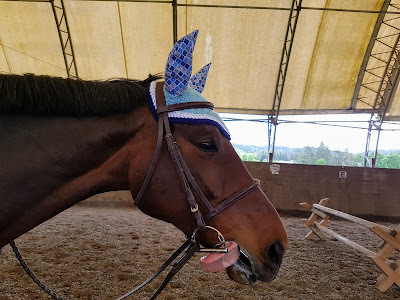 I'd like to get to the point where I can ride Casey bridleless at a walk and a trot, and be able to canter with the neck rope (bridle for backup). Get solid walk-canter transitions. We're so close to this. Casey can get them on her right-lead, although it's a bit rough. I'd like to get these a lot more solid. Figure out the sitting trot. Oh boy, oh boy, is this a challenge. I've been working on my sitting trot for the past couple of months and it's gotten so much better, but I still really struggle at this. Practice makes perfect, right? Find an Casey-acceptable dressage-legal bit & bridle set-up. Bitting has been the bane of my existence with Casey. She's super opinionated and very picky. Right now she goes really well in my Myler Combination Bit, but it's not dressage legal. 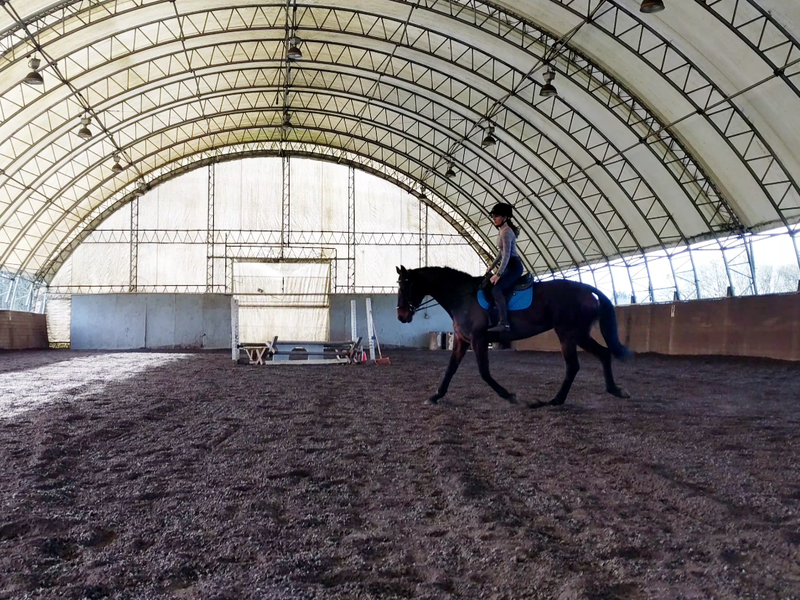 I'd really like to get back into dressage tests with Casey, but in order to do that we really need to find equipment that will work for us. I've tried many different bits with her and nothing really works, she pulls on the bit and can get her tongue over everything. So far we've tried adding a flash, tightening the bridle, loosening the bridle, a plastic bit with a single joint, an oval-link copper-coated snaffle, a wide port, and a waterford. She hates everything. Right now I'm trying to find ways to replicate things that she might like in her current set-up. The next thing we're going to try is a boucher bit (I think she might like the extra stability it provides) and I'm seriously tempted to get a Micklem bridle to see if that would make a difference. Ride (or work with Casey) 4+ times per week. Although I easily met this goal last year, I am going to continue to have this be an annual goal, because it is really important to me. If I'm not at the barn at least four times per week, I really don't think that I should own a horse. It's a huge financial burden and so I need to prioritize my barn time. I am adapting the goal though, because I think that hand-walking, lunging, or free-lunging Casey is acceptable on days that one or both of us don't feel up to riding. Take a lesson a week. I think that we'd benefit greatly from having my trainer's eyes on us regularly. Thanks to a pay raise this year and finally having paid off my car, I can financially afford regular lessons this year! 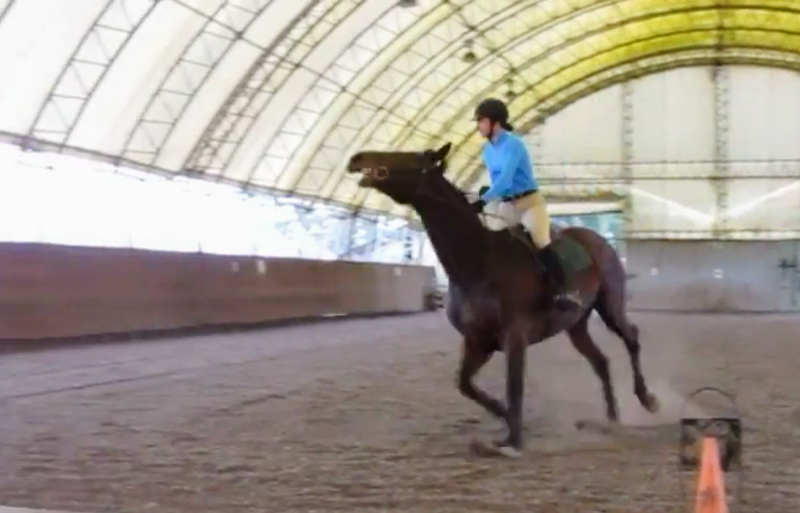 This is why we need lots of lessons, both jump and dressage! Go off-property at least once. This can be a trail ride, a schooling show, or a clinic, so long as she is trailered somewhere new. Enter at least two shows (they can be schooling shows). I think that this goal is definitely achievable, because my barn hosts shows every summer. I'd like to do at least one show in a different location, but we'll see what happens. Now that you've read mine, what goals do you have for the next year?